The art of high patisserie is alive in Austria and has spread around the world. You may not know the difference between your Kirschkuppeln and your Maroniherzen, but you've certainly eaten desserts like apple strudel, jam doughnuts (Krapfen) and a variety of what we still call Viennese pastries. Austria is a country with every region claiming its own dessert: Linz has the Linzertorte, a lattice cake with jam topping; Salzburg its Nockerln, a three-peak, cream-and-butter fluffy souffle served with a fruit sauce; Graz its Apfelschakerl, apple fritters with cinnamon. Tyrol fries Strauben (twisted dough sticks) and Upper Austria its Griesknoedel (fried semolina dumplings), while Lower Austria indulges in Pafese (plum sandwiches in batter) and Carinthia loves Reindlinge (cinnamon buns filled with raisins). As for Vienna, every hotel and patisserie worth its sugar has a dessert to its name. 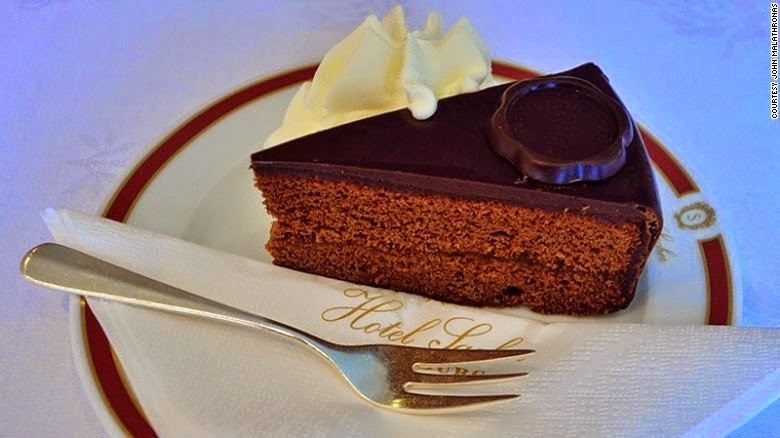 Hotel Sacher with its Sachertorte, Hotel Grand with its Guglhupf and Hotel Imperial with its Imperialtorte have the history and pedigree, but even modern hotels crave for acceptance through pastry invention. In 2014 the Ritz-Carlton unveiled the Ritz-Carlton Torte, while in 2012 the Hilton created its very own Klimt Torte in homage to the art nouveau painter on the 150th anniversary of his birth. In asking why the art of the dessert had such an impact in Austria, one has to look no further than Vienna, the old Imperial capital, where all trends originated. In the Habsburg court, desserts and cakes suggested indulgence and superiority. In an era of starving peasants, a well-rounded figure was a sign of wealth and health. Sugar provided an energy source in a cold climate as well as a quick boost of stamina for those glitzy aristocratic balls. What else were those sugar-loaded candied violets after all than a 19th-century pick-me-up for an all-night dance? But why Austria in particular? As with coffee, sackfuls of which were abandoned by the Turks after the second siege of Vienna in 1683, many believe that it was its proximity to the Ottoman Empire with its sweet tooth that gave the Austrian Empire such a craving for Oriental desserts. When the Turks were driven out of Hungary, they left a local population already expert in the art of desserts, the best of whom were employed by the aristocracy. For a whiff of Habsburg Vienna, there's Demel (Kohlmarkt 14, Vienna; +43 1 53517170). Established in 1786, it became the patisserie by appointment to the Imperial Palace, as the letters K.u.K (Keiserlich und Koeniglich) below its logo never cease to remind us. According to Dietmar Muthenthaler, head of confectionery, who has risen through the ranks, Demel's story is that of Viennese patisserie itself. "In the 18th century we did not make cakes. Desserts consisted of doughnuts, strudels and ice cream," says Muthenthaler. "Cake confectionaries followed the Vienna Congress in 1815. The Austrian monarchy started employing Hungarians, Bohemians, Italian and French and created a unique mixture." Past the Bell Epoque cafe, it's possible to watch the chefs working round the clock in the kitchen. There are 18 pastry chefs and nine apprentices who spend three years learning the trade in 12 specialized posts: from ice cream to chocolate via meringue and cookies. Seventy different products are produced fresh every day at Demel, including apple strudel whose pastry is drawn every morning so thin you can read a newspaper through it. Demel's shop windows are famous throughout the city and when they're changed a huge crowd forms to see the new decorations. Even today, they're a prime spot for tourist selfies -- no wonder with 2,000 sugar flowers adorning the displays. Some exhibits have found their way into the Demel museum in the basement, open 10 a.m.-noon on Fridays (free). This is where high patisserie crosses the threshold into art. The cakes, if one can call them that, involve meter-long Faberge egg copies, man-sized Madonna statues and huge imperial crowns that look good enough to bite into. Give Demel's chefs a drawing and they make a cake out of it. Despite the astonishing breadth of Austrian patisserie, they fall into simple categories. There are warm desserts such as the apple and other strudels, the dumplings and the souffles, and there are cold desserts, namely the cakes (torten), based either on dough enriched with eggs or dough risen with yeast. Beyond that, it's the fillings and the toppings that make the difference. One filling in particular ended up in court. It's that of the Sachertorte, Vienna's most celebrated confection, a chocolate sponge cake with two layers of apricot jam and a dark chocolate topping. It was invented in 1832 by 16-year-old Franz Sacher, apprentice to the court of Prince Metternich. Sacher temporarily substituted for the head chef who had suddenly taken ill.
Metternich's guests loved the cake and asked what it was called. The youngster uttered "Sachertorte" in a rare selfish moment, as normally new recipes are named after the aristocrats the chefs worked for, like the Eszterhazytorte. It turned out to be great PR for Sacher and easier for the rest of us who might have had to twist our tongues around "Metternichtorte." Franz and his son Eduard started a catering business but it was 40 years before they opened Hotel Sacher (Philharmoniker Str. 4, Vienna; +43 1 514560) in 1876. In the meantime Eduard Sacher had a spell at Demel, where he also baked his father's chocolate cake -- only slightly differently. The clash of the two Sachertorten divided Vienna by taste until 1962 when a court assigned the trademark to Sacher. The hotel could now call its version "Original." Since then, the Demel variety -- with only one apricot layer instead of two -- is called either Demeltorte or Eduard-Sacher-torte. Ursula Wagner, a Sacher sales director, confirms that the cake is big business. "About 360,000 Sachertorten are manufactured annually, and about a third of them are shipped around the world," she says. "During the production cycle that involves 32 steps, even the yolks and whites are separated manually by a lady whose job consists of cracking eggs all day; in Christmas there are two." And the secret of the Original Sachertorte? "The secret is in the glazed topping." says Wagner. "We use four different quality chocolates from four different countries and no preservatives. "Because of the extremely high quality of the ingredients, the Original Sachertorte keeps fresh for up to three weeks. But the provenance and percentages of each four types of chocolate are the big secret." "The things that are interesting I'm not allowed to tell you and the things I'm allowed to tell you aren't interesting." In an age of a mass production with food companies using the cheapest of materials, it's encouraging and very interesting, indeed, to hear such commitment to freshness and quality, both from Sacher and from Demel. It speaks volumes for the high standard of Austrian patisserie.